I had the pleasure of creating a really fun craft project this afternoon – a Table Top Tiki Torch Fire Pit! This was a really fun project! A couple months ago our family enjoyed a fun summer bbq at a friend’s house and we made smores (and let me tell you, I LOVE smores – I have no idea why, especially because I’m a not a huge fan of marshmallows, but they are soooo heavenly to me – they rate second only to brownies in my book, and for those of you who know me or have been reading my blog for a long time – you know I LOVE brownies more than anything) with a flower pot charcoal fire pit. My friend told me that she found the idea on…you guessed it…Pinterest. It was a blast – and I literally was kicking myself for not thinking of it sooner! 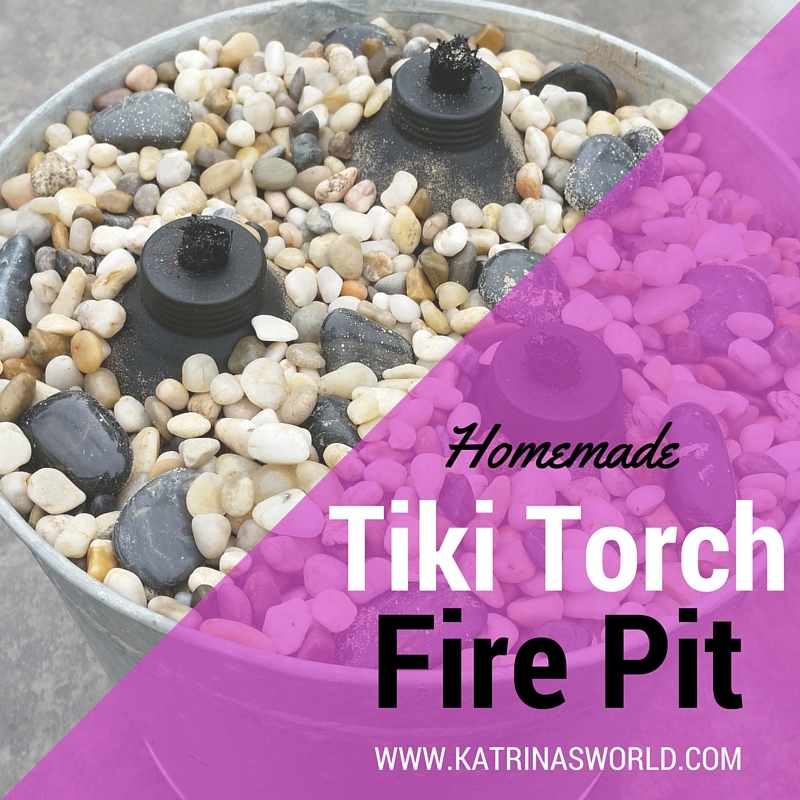 So, when I got home that same night I stayed up way to late pinning homemade fire pits – you can see all the neat ideas I found on my Pinterest page – All these great ideas led me to create a similar version of my own! I really liked the idea of the tiki torch as the flame because it was quick and easy and didn’t need to heat up for a long time. Plus I really liked the modern look of the semi-buried torches with decorative rocks as the accent. I decided to start pricing out my supplies and this is when I got bummed. Although none of the supplies were super pricey, once I added it all up, we were talking close to about $100 if I bought everything brand new. Time to move on to Plan B. I looked around the house to see what I could find that I already had on hand and I found an old stainless steel flower pot that was just sitting on the shelf in my garage. Then I asked around on a couple free Facebook groups for used tiki torch canisters and ended up finding 4 of them – FREE! Over the next couple weeks as I went to local garage sales, I found a couple different bags of decorative rocks for 50 cents! Score again! I still needed sand and remembered that I have a big sand box in the backyard - FREE sand! The only thing I needed to go out and purchase was tiki fuel – which cost only $5.40 for a big bottle! 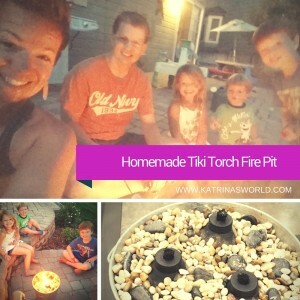 So for less than $6 I made a great table top tiki torch fire pit and we had a great time tonight roasting smores! Would love to see what you come up with! 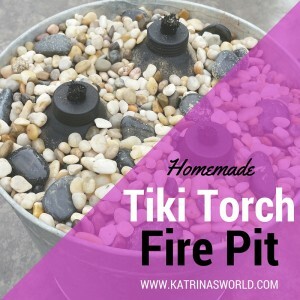 Post a picture of your homemade fire pit on my Katrina’s World Facebook page of your own homemade fire pit!